Three students have been selected to form a news team that will provide regular updates on the progress of construction of the new north Chatham Catholic elementary school on McNaughton Avenue, West.. Upon Whose Shoulders We Stand is a 35 minute documentary celebrating the immeasurable contribution of Catholic Religious Orders to the education of our youth in Ontario Catholic schools over the past 150 years. To continue to develop awareness and understanding of First Nation, Métis and Inuit cultures, histories and perspectives in all St. Clair Catholic District School Board classrooms as we work towards improving student achievement and well-being among First Nation, Métis, and Inuit students. Blessings to You as We Begin Our Lenten Journey Together! Today, we begin our Lenten journey together! Lent is a time of repentance, fasting and preparation for the coming of Easter. It is a time of self-examination and reflection. Today, we focus on our relationship with God, often choosing to give up something or to volunteer and give of ourselves for others. I recently found this reflection on the beginning of Lent. It’s from The Santa Rita Abbey, a monastic community of Sisters located in Arizona, within Diocese of Tucson. I hope it is as meaningful for you as it was for me. 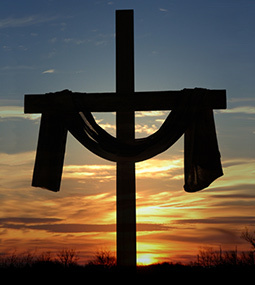 Blessings to you as you begin your Lenten walk towards the joy of Easter! Why Do We Do the Things We Do During Lent? Good questions. Why DO we do the things we do during Lent? This leads to an even bigger question: who is the God I believe in? Is God Someone who cares for me with every fiber of His being, whose joy it is to be an intimate part of my existence? Who walks with me in moments of pain and sorrow and dances with me in moments of joy? Yes, this is the God who stands with us at the threshold of our Lenten journey. A God who has promised to be with us through all the ups and downs of life. Father, we don’t need to appease you by our Lenten denial. We already have your love and favour. If we deny ourselves–the selfish, isolated parts of ourselves that we still cling to–it is because we know that we are safe in your love and we can let ourselves free-fall into your heart. That heart which will enfold us in healing and transforming love. We do what we do during Lent because we are loved. We know that by inviting you into our depths, we say yes to your healing presence and that “your hand will do all things for us,” as we say in the psalm. There you have it. That is the beginning and the end. We came from love, we live in love, we return to love. May our Lenten journey be a sharing of this love with all creation by opening out our depths to Him in trust, and may our Lenten practices create in us quiet places where God can refresh and heal us, and we can come and rest awhile. 25-Mar-19 Curtain Set To Go Up On UCC's Production of "In The Heights"
Chatham-Kent & Sarnia-Lambton SchoolsThank you for your interest in the St. Clair Catholic District School Board. The following career opportunities are open for both employee and public application. For Teaching positions we are using Apply to Education. If you wish to be considered please ensure that you are registered with www.applytoeducation.com. Instructions on how to create an account in Apply to Education are attached here. Individuals wishing to apply to the St. Clair Catholic District School Board for a Teaching position are asked to follow the Application Process for External Teachers and New Faculty Graduates. Applications are only accepted through “Apply to Education”, our external service provider. For Non-Teaching positions, submit a resume and cover letter as per instructions on the posting. If applying to a specific position posted, please ensure to include the job posting number in the email subject line. fostering stewardship, leadership, and social justice.